270 pages | 49 B/W Illus. The NABCEP PV Installation Professional (PVIP) Exam is the gold standard certification exam for PV professionals and is famously difficult to pass. As the industry grows and jobs have become more specialized, the Board has responded to this with NABCEP Specialist Certification Exams. As well as the content of the PVIP, this book also covers the material in the Design, Installer and Commissioning & Maintenance Specialist Certification Exams, and provides test-taking strategy that can be used to most effectively study for and pass these assessments. Code and theory is explained in the first half of this guide, acting as a useful background for the second half, which consists of practice exam questions and answers, complete with detailed explanations. It also contains essential strategy tools, short-term memory tips and recommended reading which will be invaluable for anyone studying for the exams. 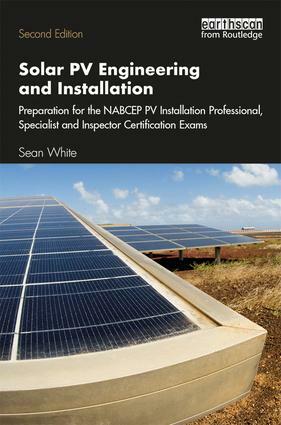 The material covered in this book is not limited to those taking the test, but will also act as a valuable tool for career progression, helping the reader to work safely with code-compliant PV systems. This second edition has been fully revised and updated to reflect the new developments in solar and energy storage systems and new technologies.